Gold rose overnight in a range of $1309.90 - $1318, fading some weakness in the US dollar, though trading activity was thin and activity muted ahead of this afternoon’s FOMC meeting statement and the subsequent press conference by new Fed Chair Powell. The DX dipped from 90.43 down to 90.10, pressured by a firmer yen (106.54 – 106.23), pound ($1.40 - $1.4075, positive UK employment and wage data), and euro ($1.2240 - $1..2291). This boosted gold through initial resistance at $1313-15 – (quadruple bottom, lows 3/2, 3/9, 3/12, 3/13) and $1317 (3/20 high) to reach $1318. A firmer US 10-year bond yield (2.905%) was a headwind for gold, however, while global equities were mixed. The NIKKEI was closed, the SCI was off 0.3%, Eurozone shares ranged from -0.4% to +0.2%, and S&P futures were flat. Firmer oil prices (WTI from $63.50 - $64.25, API reports surprise crude draw in US inventories) helped to support stocks. At 8:30 AM, a larger US current Account Deficit Balance (-$128.2B vs. exp. -$125B) pushed the DX further down to 90.01. Gold ran higher in the pre-FOMC thin conditions, and took out some buys stops over the double top at $1320-22 and $1324 (down trend line from 2/16 $1362 high) to reach $1326.80, where resistance in front of $1328 -30 (quadruple top, 3/8, 3/13, 3/14 ,and 3/15 highs) held. By late morning, US stocks turned higher (S&P +14 to 2731), with news that Republicans and Democrats struck a preliminary agreement to fund the government ahead of Friday's deadline, a further advance in oil (WTI to $65.26 ,6-week high, EIA confirmed API report with a surprise drop in US crude inventories), and news that Facebook’s Zuckerberg would address the data breach crisis as tailwinds. The US 10-year yield rose further to 2.911%, and the DX rebounded to 90.22. 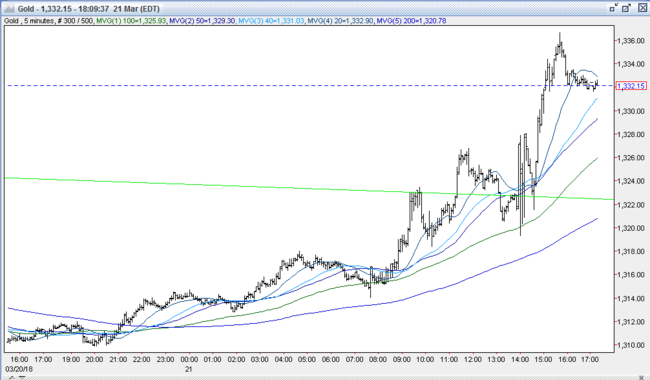 Gold retreated, and pulled back to support at the prior resistance of $1320-22 - awaiting the FOMC statement. Lifted their benchmark rate to 3.4% at the end of 2020, up from 3.1%. Increased GDP for this year to 2.7% from 2.5%. US stocks rallied (S&P +22 to 2739), the US 10-year yield popped to 2.936% (1-month high), while the DX rebounded to 90.26. Gold sold off, and slid back to $1319. The probability of a 25bp rate hike in June increased to 83.2% from 79.1% just before 2PM, while the chance of a hike in Sep rose from 56.1% to 56.9%. However, the probability of a 4th hike in Dec declined from 38.1% to 35.2%. The 10-year yield collapsed down to 2.878%, and the DX tumbled through stops under 90 to reach 89.64. US stocks turned negative, with the S&P ending off 7 to 2716. Gold rallied back sharply, and triggered some buy stops over $1328-30 (quadruple top, 3/8, 3/13, 3/14 ,and 3/15 highs), the 40 and 50 day moving averages at $1331 and $1335 (50% retracement of down move from 1/25 $1366 high to 3/1 $1303 low) to reach $1336.65 (short covering seen). The yellow metal was $1333 bid at 4PM with a gain of $23. Open interest was up 4.8k contracts, showing a net of new shorts from yesterday’s decline. Volume was similar to yesterday’s with 354k contracts trading. With markets expecting a more hawkish FOMC statement, the dovish nuggets provided the bulls with enough ammo to turn around the recent climb in the DX and reverse gold’s probe lower. The bulls should see some open field running until the triple top at $1341 (2/26, 3/6, and 3/7 highs). 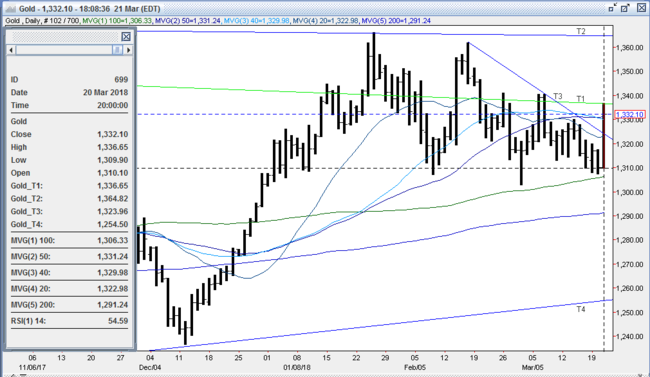 Beyond that, bulls will need the dollar to breach next supports at 89.56 (3/12 low) and 89.36 (3/7 low) in order to test the next resistance levels in gold at $1347 (2/20 high), $1351 (triple top 1/29, 2/1, and 2/2 highs), $1362 (2/16 high). Though some bears were run out of the market today, many remain comfortable selling into rallies. Bears point out that despite a significant pullback in the 10-year bond yield today, it remains well above 2.85% and within spitting distance of 4-year highs. They expect equities to continue to rebound off of their correction 2 months ago, and expect the DX to resume its bounce off of the 88.25 low last month to pressure gold lower. Bears are targeting a breach of support at the prior resistance at $1320-22 followed by the quadruple bottom at $1307-10 to bring into play key support at $1303-06 (100-day moving average, 50% retracement of up move from 12/12/17 $1236 low to 1/25/18 $1366 high,3/1 low).